For a while now we have been wanting to build a solar oven. This summer we’ve made it happen! 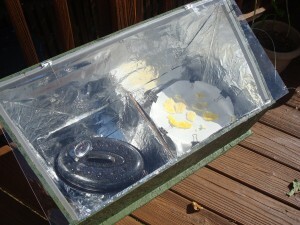 The completed solar oven in use, cooking food and refining beeswax. 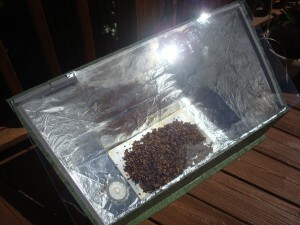 First we did some research on solar ovens. There are several different configurations one can build. We went with a box cooker design. This is not the type of solar oven that gets the hottest, but it is the most hands-off in use. 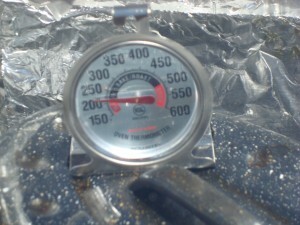 Other designs require frequent adjustment of the solar oven so that it faces the sun head-on. 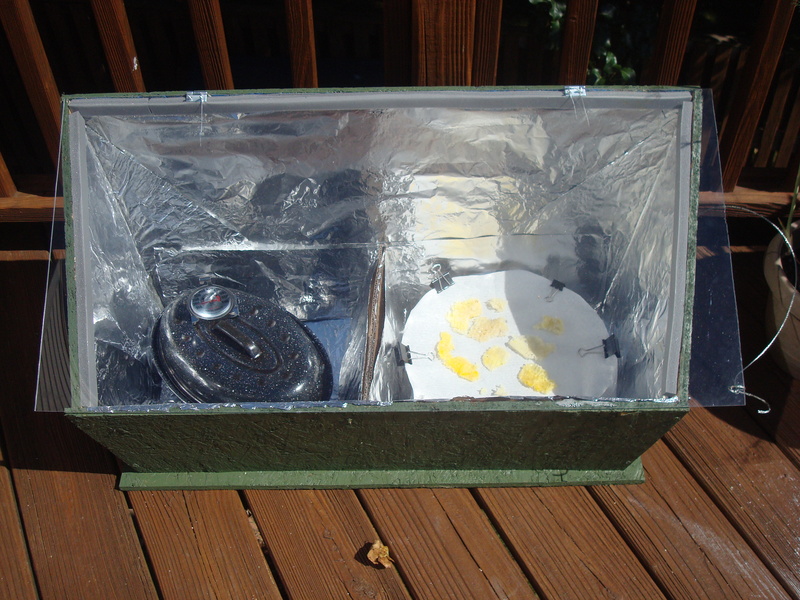 The solar oven we built works pretty well without us having to adjust it during the day. 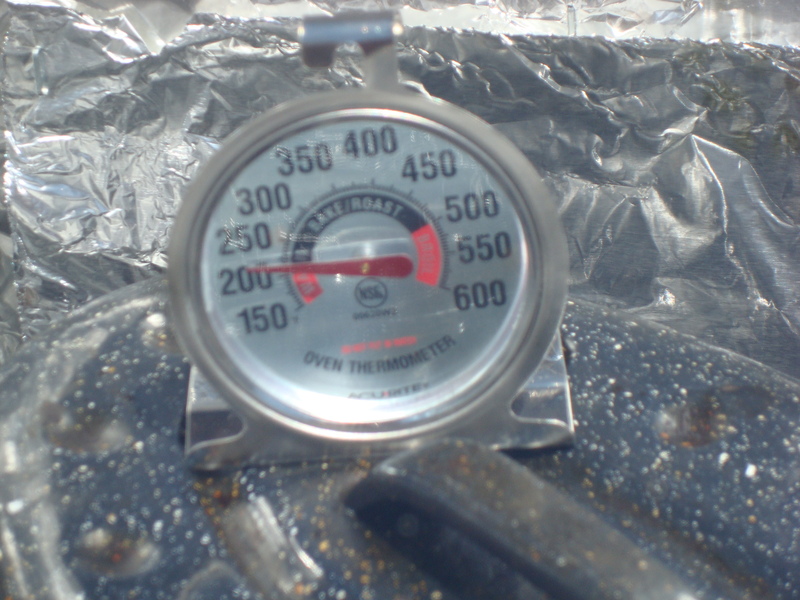 A key characteristic of a box cooker is that it needs angled surfaces that direct the sun’s rays into the center of the box. Usually those surfaces are flaps that are above the box. George thought it would be more effective if the box’s sides were angled. He spent a long time calculating how to make that work, though. We realized that the reason angled sides are uncommon is because it takes a lot of math to figure out how to make that work. This is especially true because the back side is supposed to be taller than the front side, so there are a lot of different measurements and angles going on here. Once George figured out the dimensions of each side, he used a circular saw to but the sides out of a piece of 4×8 particle board we’d bought. A few pieces cut and ready to be assembled! Next he screwed all the pieces together. Then it was my job to paint the exterior of whole thing. We used some outdoor paint that we’d already had on hand. After the wood was painted, it was time for me to put on the lid. We had some leftover clear acrylic sheet from a previous project, and that was to be the lid. It was tricky to screw in the hinges without cracking the acrylic. I drilled holes first, and then carefully drilled in the screws from the hinges, making sure the drill setting wasn’t too high. We used two hinges for the lid. Then I screwed the hinges into the wood of the stove. Testing out how the lid worked, I realized that it was too flimsy to simply be held by the hinges. When the lid was opened all the way, there was too much pressure on the hinges and something was bound to break. So I put some an eye bolt into the wood on the side of the stove, drilled a small hole in the corresponding edge of the lid, and threaded a wire through both. The wire would be taut before the lid was opened to its limit, keeping the lid from being at the point where there was stress on the lid. Notice the two hinges at the top. At the right side of this picture you can see the wire through the hole in the lid. Finally it was time to line the interior of the stove with aluminum foil so that it would reflect the sun’s rays toward the items in the oven. 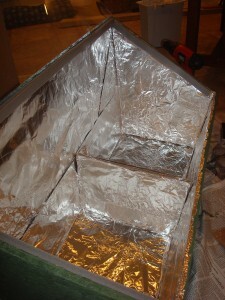 After lining the solar oven and putting in insulation. You can see the tools used here, too. 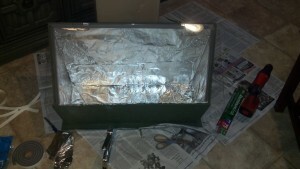 I used a staple gun to attach the aluminum foil. I had to be careful, though, as the foil is thin and could easily rip. 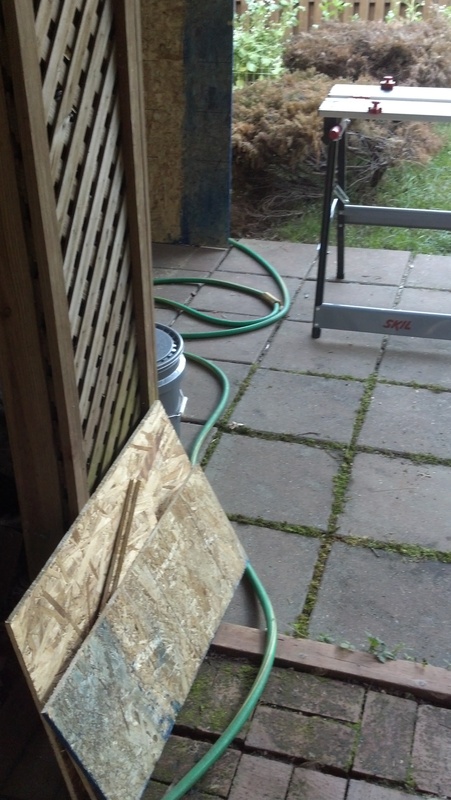 Then I attached some door insulation around three sides of the interior rim of the oven. We had this on hand, and George and I thought it might keep hot air in. These three sides and some slight air gaps between the sides and the lid, and we wanted to lessen as much hot air escape as possible. Our solar oven was ready to go then! But there was one more extra we wanted to make. You’ll notice that our solar oven is a rectangle. We wanted it to be big enough to cook two things at once. But the item gets hottest when it’s in the center, so all sides are angling rays toward it. So I made a small, removable center wall that can be put in between two cooking items. 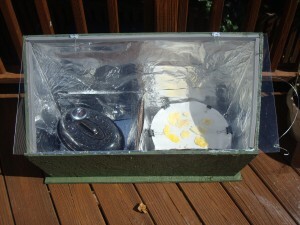 Here’s the completed solar oven. You can see the movable center wall in the middle of the oven. I made that center wall out of two pieces of cardboard, with a piece of tape across the top. I then covered it with foil, which I stapled on. We can make the wall straighter or more angled as needed as well. Once the oven was ready to go, I used it first to make some dog treats. Using the solar oven to dehydrate some dog treats. Since we try not to waste anything in this house, I was eager to make dog treats out of the leftover grains from brewing beer. I mashed the grains together, and spread the mixture thinly on a baking sheet. I set this out in the solar oven at about 10am, and left the entire thing alone all day. I checked the temperature on the thermometer a few times, and the oven was at about 225 deg F.
When I took out the baking sheet in late afternoon, the grains were all dried out and easily broker into crackers, which is exactly what I was expecting. Overall the first attempt with the solar oven was a success!